Kicking off the day’s preceding at 8.45am were the B Boy’s division followed by the C Mix, B Mix and the B Girl’s divisions. The weather perfected on the day for the games as the youngsters ran a whirl for all those who came to cheer them on. 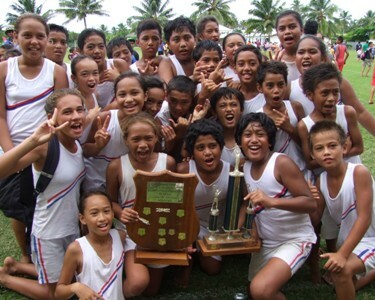 A triumphant Avarua B Boy’s team was crowned champions in their division while the Avarua B Girls team retained the champion’s trophy in the 2013 CITC Coca-Cola One Day Primary School One Day Tournament. Takitumu took out second place while Arorangi placed third after defeating Avatea in a penalty shoot-out to determine the winner. In the B Girls category Avarua has managed to take the top honors for three consecutive years while Avatea took second place and Takitumu snatched third place ahead of St Joseph. St Joseph Primary School have retained the B Mixed division title for another year, after winning this title for the last four years. Takitumu Primary School took out second place and Akatemia Imanuela in third place edging out Nikao by points difference. In the C Mixed division, Wednesday’s tournament saw Avatea as the 2013 winner following a penalty shootout against Takitumu who then took out second place while Papaaroa placed third. Just Play project manager Michelle Paiti, CIFA Development Officer Tahiri Elikana, CIFA President and CITC Coca-Cola key brands manager George George presented the trophies after the final games with the students cheering on as their schools claimed honors for the 2013 CITC Coca-Cola Primary School One Day Football Tournament. “The day’s event went really well and we are pleased to see the youngsters having a great time playing the beautiful game of football amongst their peers,” says Tahiri Elikana. The Cook Islands Football Association would like to thank CITC Coca-Cola for their support for this event and all the schools, students, parents and teachers for the continuous participation. See you all again next year.